I don’t know why Miss Anderson says this, after all the room is pleasant enough. The Pleiades Club for Ladies, located in the Compound near the main shopping district, is very well appointed and their library, where we are now seated, is quiet and friendly. The furnishings are of the highest quality—all buttoned leather and English oak—and the air is kept circulating by a fan in the ceiling. I know that name. It was General Makepeace-Flynn who was the subject of her second major case. One with considerable scandal surrounding it though, in all fairness, each of her cases has had a sordid aspect in one way or another. Now she looks at the window. Her hair is long, thick and straight but done up in an elegant French style. I could wish for hair like that, and someone with the skill to work magic with it. Her maid is outside: she’s very tall and gave me quite a menacing look as I shut her out. Her response makes me feel more confident. She is an impressive woman despite her youth, and when she walks into a room, you notice her. Yet I am certain she is completely unaware of the impression she gives. She has genuine modesty and that, in its turn, gives me confidence. “A game?” Her voice drips with scorn. I have struck a nerve. “These are real people, Miss Churchill. This is not some silly fiction story. I know you journalists, always getting the story and never caring about the individual. You don’t have to live their lives, nor feel their pain. You speak to them and move on. You print your distorted versions of the truth to boost sales.” She pauses for a breath. I realise I am leaning forward and force myself back into the supporting comfort of the chair. I raised my hand and waved away the tension between us. This was about her, not me. “That must be difficult,” I say quietly, not looking up. She looks away and sighs again. “Ridiculous name,” she says, “invented by a journalist with too much imagination.” She rubs her thigh as she talks and, at a guess, I don’t think she even realises she is doing it. My research told me she had almost been killed and had suffered a major injury to her leg. It also said she used a cane for walking, but she did not have one with her and, as far as I could see, did not even limp. “I didn’t hate the school,” she said. “I loved school. It was the people who were the problem. To them I was nothing more than an intruder into their precious white world. I was the target for all their practical jokes. I pause. I had had a fine time at school, even though I was technically an advertisement: See Winifred Leonora Spencer-Churchill, daughter of Lord Randolf Churchill (brother to the Duke of Marlborough), attends this school. Your daughter should attend as well. And because of that my parents did not have to pay the fees, which suited them. Just because one is nobility it does not follow that one has money. Why did she say that? Because she has stated how much she dislikes people as a whole? Well, I am now a spinster in my mid-30s and thoroughly on the shelf but I have known love. It has not been easy for me either, but my experiences are irrelevant here. She goes to speak and then stops. She pulls a kerchief from her bag and dabs at first one eye and then the other. The silence is like a cloak. I want to apologise, but I won’t. Her shawl slips from her shoulders and, in the mirror behind her, I see scars cut into her back. They are recent and have not healed fully. She readjusts the shawl and they are gone. Finally she turns to look at me. Her eyes are red and wet. This is not the woman I found in my research. She was hard, and strong; like a goddess of vengeance. “I made a mistake,” says this different woman. Her voice is barely above a whisper. There is a knock on the door. It opens immediately and the maid, Amita, steps through. She says nothing but, on seeing the state of her mistress, gives me a glare hot enough to melt steel. It seems Miss Anderson has a protector. I get to my feet as does Maliha Anderson. She has her mask on once more, and holds out her hand. She smiles at me. The change in her face is astonishing, as if a light has come on. 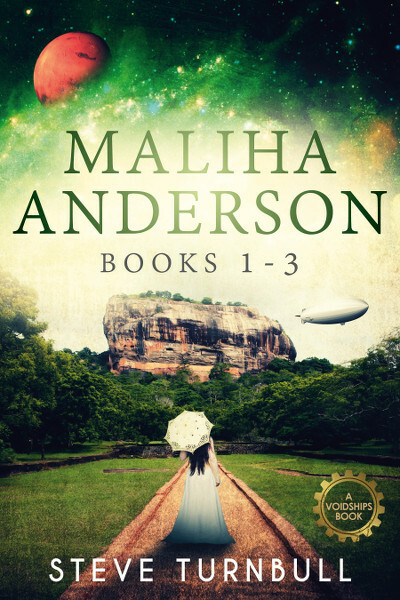 Buy the first three Maliha Anderson books in one volume.